Our Beginners Riding Package is a fantastic introduction to horse riding for first-time riders. Our qualified instructor, who has extensive experience in teaching beginners how to ride, will lead you through the week, ensuring that each day you build on your newly acquired riding skills. The aim of the week is to teach you everything you need to know so that by the end of the week you will be able to comfortably trot and – depending on progress – canter independently. We will also teach you how to care for you pony/horse, how to tack up, to understand road safety and general stable management. At the end of the week we can tie in all your learning with a 4-hour pub trail across the moor to the pub in St Breward. You can enjoy putting your new-found skills to the test by steering your way over Bodmin Moor, past gorse bushes and through rivers. The Pub serves excellent local food overlooking the village green. For non-riders there are plenty of activities within a short drive – from a round of golf at Bowood Park in Camelford to guided walks on Bodmin Moor or the South West Coast Path. A short walk in the morning to the riding yard where you will feed and groom your pony/horse. Afternoons at leisure for sightseeing or further riding by arrangement. 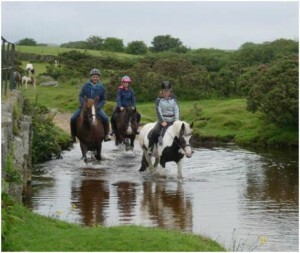 Prices start from £915.00 for 6 days riding and 7 nights self-catering accommodation. Full board is also available – just £100 extra per person. Want to try something new? Whatever your age horse riding is a fantastic hobby and and exciting way to learn new skills, make new friends and enjoy yourself! We’re launching a new Learn To Ride 3 night short break for beginners of all ages. The 3 nights/4 day break includes 3 nights self-catering accommodation in one of our lovely cottage, 6 hours expert tuition including a moorland ride and lots of information on stable management, tacking up and caring for your horse. All this for just £295 per person Friday – Monday or Tuesday – Friday. Non-riders also welcome. Please call us on 01208 851500 for more information.